The headline of this article "lets kill leadership", and the fact that it was from London Business School attracted me. I agree that the kind of leadership the author Jules Goddard refers to should be eliminated! Yet I see a very different kind of leadership gathering momentum. And a very different kind of management too. In my work with clients I inspire and encourage leadership as the art of ensuring people feel valued. There's nothing in the above about followers, control, hierarchy or any of the many dark sides of leadership. Leadership that ensures people feel valued must be supported by management. I define management as the practice of ensuring it's simple for people to deliver value. There's nothing in the above about managing people or change which is conventional wisdom that I believe is actually unwise. Management in the 21st century is about processes which includes policies, procedures, practices and systems. 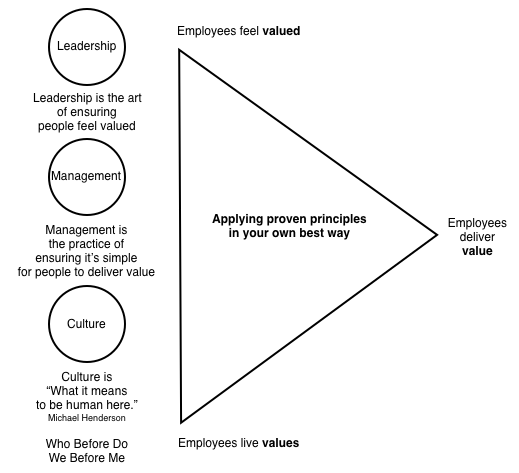 Leadership and Management as defined above are underpinned by culture. Culture is about what it means to be human. Typically culture is defined as the way we do things around here. For me this is only part of the story. Culture is Who Before Do. It's what I call Fully Human Leadership. Leadership, Management and Culture have changed. Have you? PS Please contact me should you like some help. 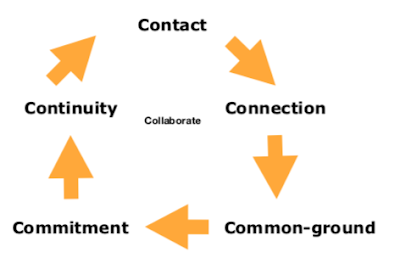 We can work together with you applying the proven model below in your own best way. "Lead with a vision of human awesomeness"